It’s the official start of summer and there’s sure to be lots of gatherings with family and friends sharing good food and drinks as we pay respect to those that have served our country. 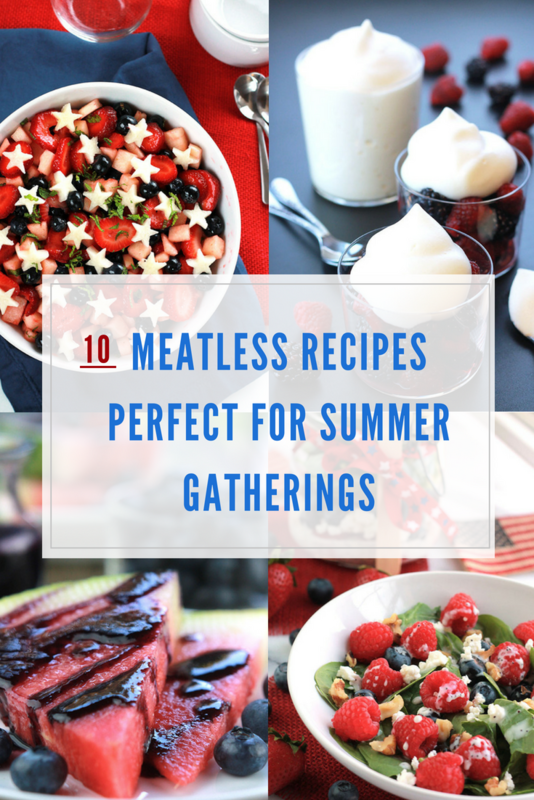 If you are vegetarian, vegan, or need recipes for meatless eaters in your group I’ve put together 10 Meatless Recipe Perfect for Summer Gatherings. 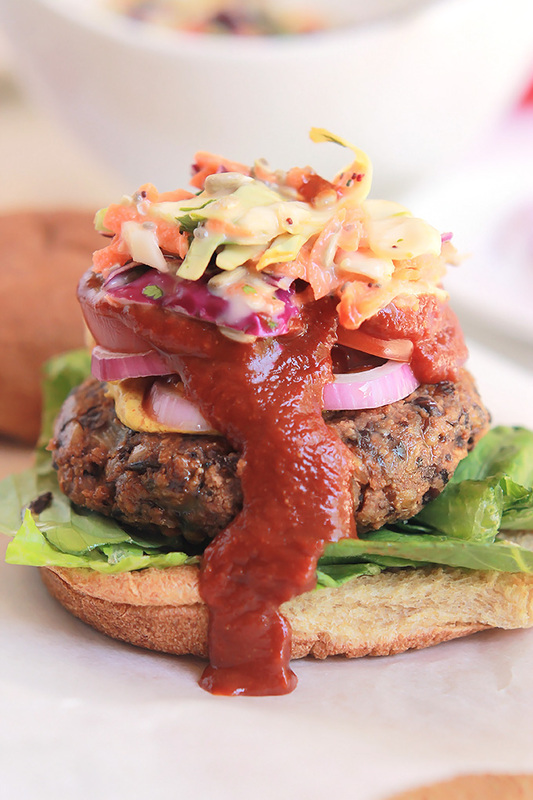 Black Bean Farro Burger – Simply delicious and full of flavor, you have to give this Black Bean Farro Burger a try, and serve it with this super tasty Spicy Slaw. 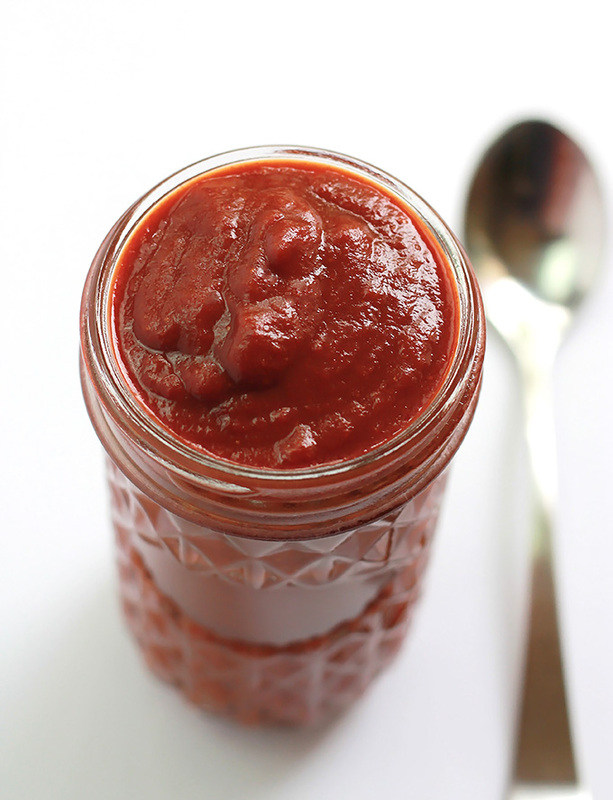 Homemade Vegan Barbeque Sauce – Thick, tangy and sweet with a little bit of smoky is the best way to describe this Homemade Vegan Barbeque Sauce and just in time for the upcoming grilling season. 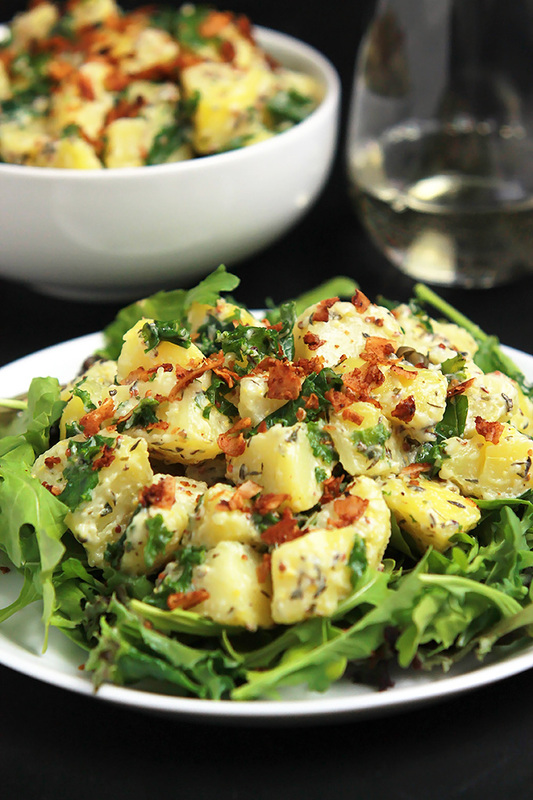 Yukon Kale Potato Salad – Yukon Kale Potato Salad-Sweet golden potatoes and chopped kale tossed together in a creamy dressing, garnished with a sprinkling of coconut bacon. A delicious twist to a traditional summer side for the vegetarians or vegans in the crowd. 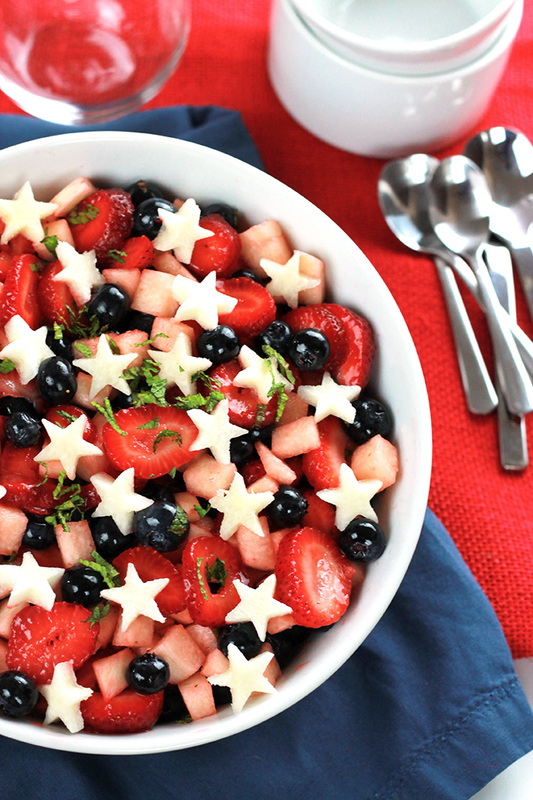 Strawberry Blueberry Jicama Salad – Sweet juicy strawberries, plump blueberries, and crisp jicama, together they make the perfect patriotic salad. This Strawberry, Blueberry, Jicama Salad is easy and deliciously healthy. 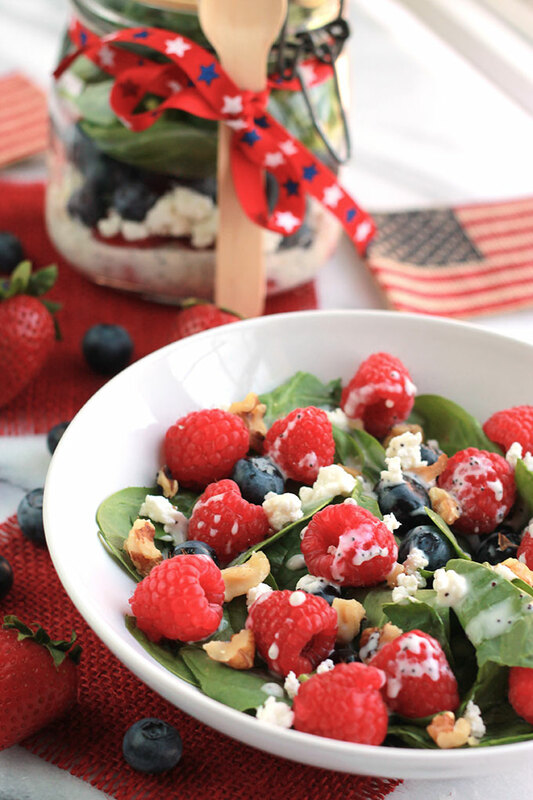 Red White and Blue Salad with Poppy Seed Dressing – Layers of fruit, creamy goat cheese and lettuce, this Red White & Blue Salad with Poppy Seed Dressing is colorful and perfect for patriotic celebrations. 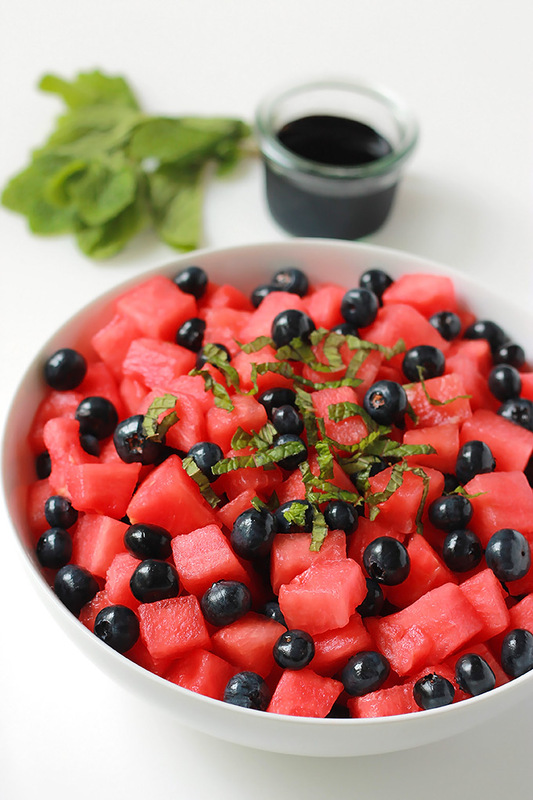 Watermelon Blueberry Salad – Sweet juicy watermelon and plump blueberries drizzled with lime, agave and topped off with mint. 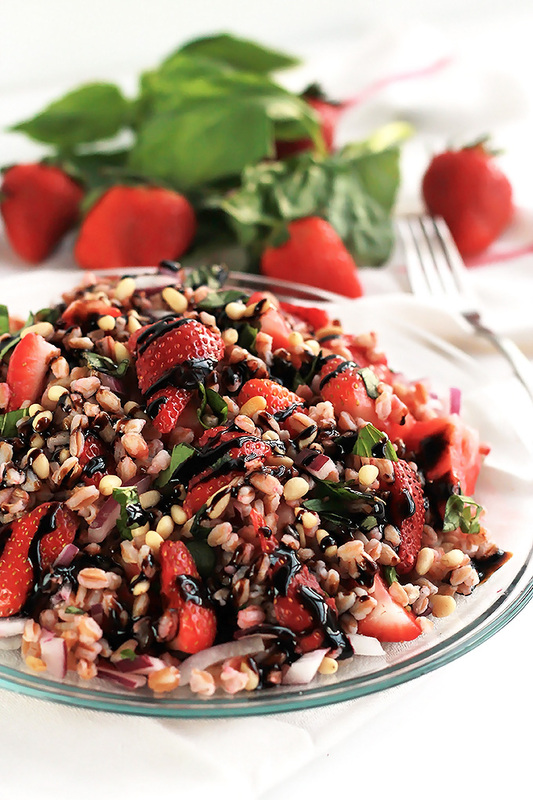 Strawberry Basil Farro Salad – The tender bite of Farro, the sweetness of Strawberries and the earthiness of fresh basil makes this Strawberry Basil Farro Salad the perfect combination of sweet and savory. 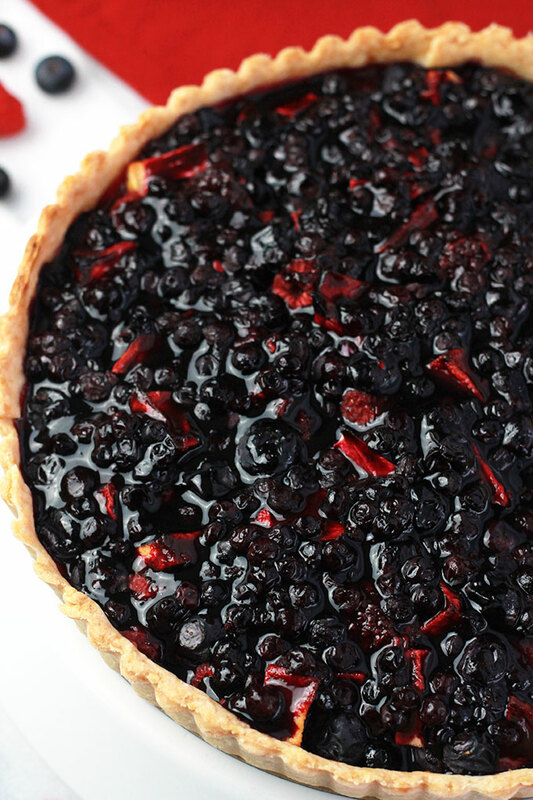 Blueberry Raspberry & Apple Tart – Blueberry Raspberry & Apple Tart, topped off with Wild Blueberry Sauce, amazing texture, and flavor. Perfect for summer holiday gatherings. 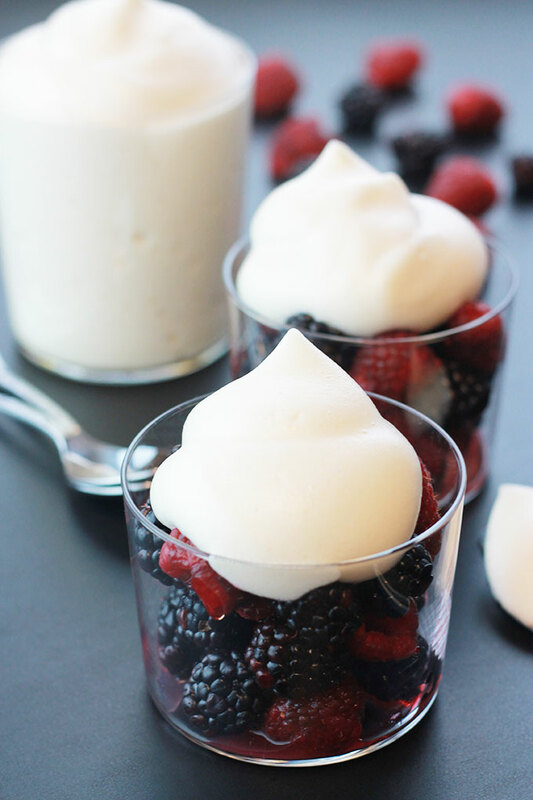 Amazing Whipped Aquafaba – Smooth creamy and a magical wonder, who knew liquid from chickpeas could be so fabulous. 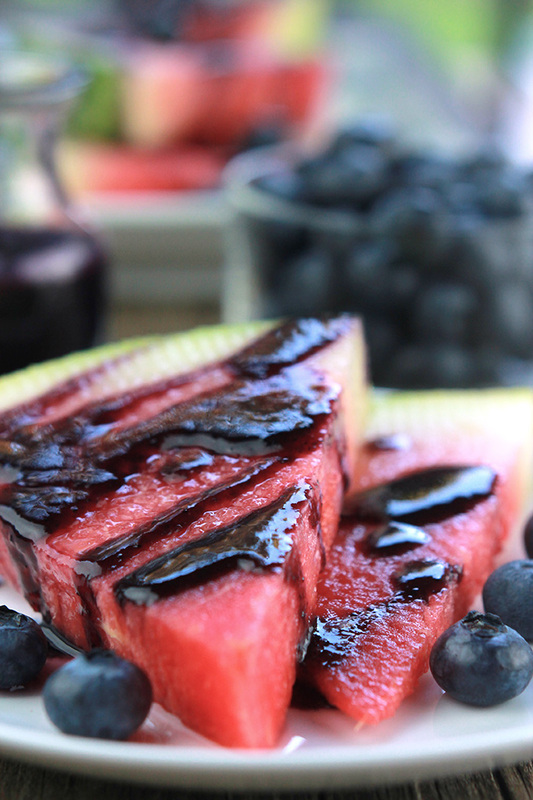 Blueberry Glazed Watermelon – This Blueberry Glazed Watermelon is a perfect way to enjoy the fruits of summer. Have a safe and tasty Memorial Day weekend! Such a great collection of recipes for the holiday weekend! Loving all the watermelon ones! The watermelon ones are some of my favorites as well. What a beautiful and healthy display of favorites for this summer! I’ve never tried aquafaba before, but I’ve heard so many good things, I think I should give it a go. Great roundup! Give it a try, it’s amazing. Great collection! Everything looks so fresh! These recipes are all so beautiful and healthy. Thank you for gathering them all together. Thanks so much Ginny, hopefully, you can enjoy them all summer long. Every single one of these recipes I would gladly eat!! We eat meatless a few times a week and I’m going to rotate a few of your recipes in as they look delicious! I make a similar farro burger but I can’t wait to try your recipe! So, I’ll be starting with that one! Thanks, I hope you enjoy them. BTW, Elaine, can I find your farro burger on your site? That blueberry and apple tart looks amazing. I am definitely going to be making that over the summer. It’s very good with ice cream on top. This is a delicious round-up that could keep a menu going all summer long. Yeah for all, vegans, vegetarian and meat eaters. That’s what I love about these recipes. wow what a delicious roundup of recipes..pining it as well. Thanks for sharing. Thanks, hope you have fun with them. Oh my goodness this look absolutely amazing! It truly looks delicious! Ohhh I can’t WAIT to try this! So YUMMY! Thank you for this great recipes! You are very welcome Neli, enjoy! So many great options! I think the black bean burger is the one to try first! Thanks! Have fun and enjoy Sara!! These recipes look so delicious. The photography is absolutely stunning! Thanks, Andrea glad you like them. Seanna, I hope you do that and let me know how it turns out.